Today was Day #8 of Milk Chocolate Theme Week -- which I celebrated with the lowest cacao percentage bar yet this week. However, percentage doesn't tell the whole story. 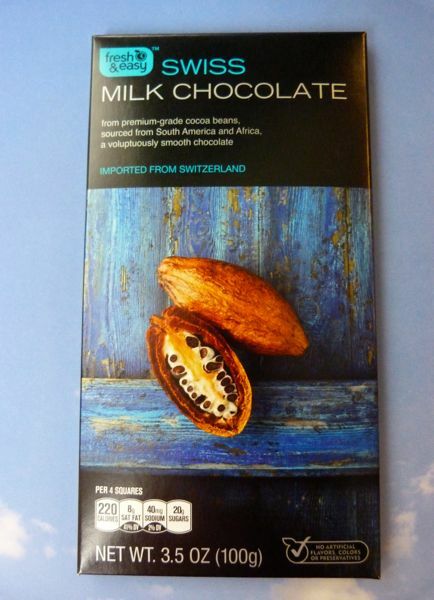 This smooth, 31% cocoa content Swiss Milk Chocolate bar from Fresh and Easy (El Segundo, CA), was imported from Switzerland, and I liked it better than some bars with more cacao. The bar also packed a secret weapon: a creamy, nutty taste thanks to a small amount of added hazelnut.